The baseball forces the bat to the left (an action); the bat forces the ball to the right (the reaction). 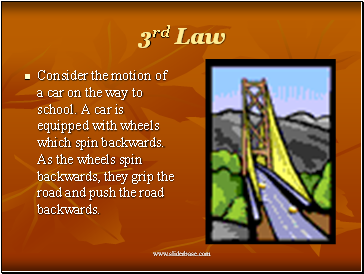 Consider the motion of a car on the way to school. A car is equipped with wheels which spin backwards. As the wheels spin backwards, they grip the road and push the road backwards. 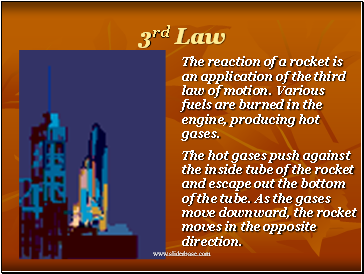 The reaction of a rocket is an application of the third law of motion. Various fuels are burned in the engine, producing hot gases. The hot gases push against the inside tube of the rocket and escape out the bottom of the tube. As the gases move downward, the rocket moves in the opposite direction.